Central Florida Community Arts is proud to present Into the Woods as the inaugural performance of its brand new CFCArts Theatre Program! Different from our large scale Summer Broadway Season concert version production, this will be a creative, immersive, fully staged show in an intimate space. Experience this full-length musical theater masterpiece, directed by Donald Rupe, in a whole new way! 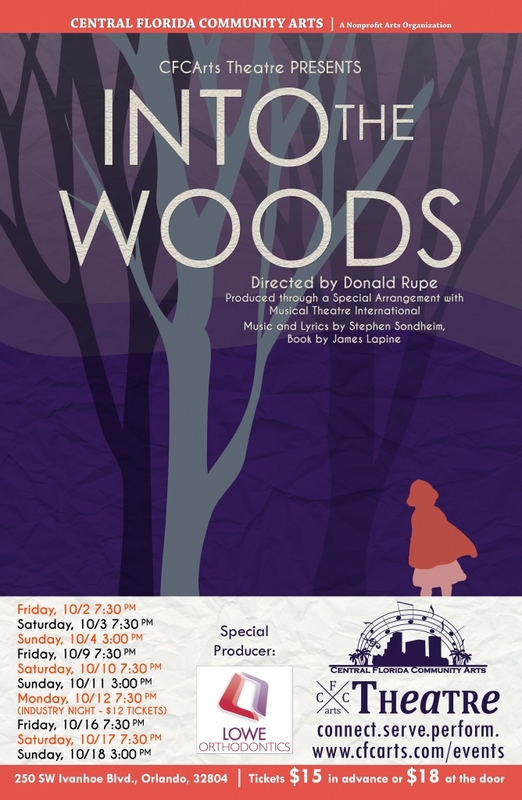 Seating for all Into the Woods shows is limited and advanced purchase is strongly recommended. Guaranteed seating can be purchased in advance for $15 (credit card/Paypal) or, if available, can be purchased for $18 at the door (cash/check only). Tickets for Industry Night are just $12! Doors open 30 minutes before showtime and all seating is general admission.